MAKE THE STOCK: In a large saucepan, combine the water with the onion, carrots, leek, celery, garlic, bay leaves, thyme, and cloves and bring to a boil. Reduce the heat to moderate, cover and simmer for 50 minutes. Strain the stock into a medium saucepan, cover and keep warm. MAKE THE RISOTTO: In a medium skillet, melt 2 tablespoons of the butter. Add half of the minced shallot and cook over moderate heat until softened, about 3 minutes. Add the carletti a handful at a time, stirring between batches until wilted. Season the baby greens with salt and pepper and set aside. 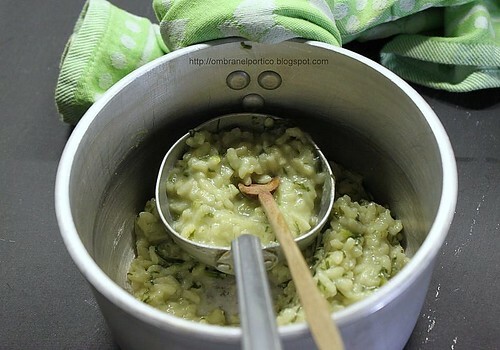 In a large saucepan, melt 1 tablespoon of the butter in the vegetable oil. Add the remaining shallot and cook over moderate heat until softened, about 5 minutes. Add the rice and cook over moderately high heat, stirring to coat the grains, about 2 minutes. Add 1 cup of the warm stock and cook, stirring constantly, until nearly absorbed. Continue adding the stock 1/2 cup at a time, stirring until it is nearly absorbed between additions. The risotto is done when the rice is al dente and suspended in a thick, creamy sauce, about 25 minutes total. Stir the wilted greens and the remaining 2 tablespoons of butter into the risotto and season with salt and pepper. Serve at once, passing the cheese at the table.